Elegant place cards are proper for any event. Hyegraph Invitations & Calligraphy was asked to print these fine William Arthur high quality place cards with our Digital Calligraphy for a private “Armani” event here in San Francisco. William Arthur place card were chosen because of their elegance, and high quality papers. Jacques has been perfecting the art of digital calligraphy for over the past 30 years. He is always adding new fonts and colors to his repertoire, asked to do so by his clients who are socialites, sports figures, wedding and event planners and his lovely Bay Area couples. The place card below which reads, “Signor Giorgio Armani” is printed using Hyegraph’s Digital Calligraphy in ‘Lily Wang’ font style and gold ink. 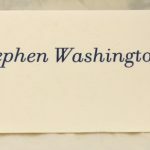 The place cards were printed for an event in San Francisco where Giorgio Armani, owner of the Italian Brand Giorgio Armani would be present. 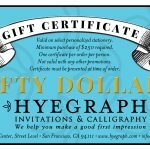 The above place cards measure 4×4, come in a quantity of 100 sold at retail for $50/a pack at Hyegraph in San Francisco, CA. The card stock is ivory, the ink color is Gold and the font style is ‘Lily Wang’. The price for Calligraphy printing on the place card is $1.00/card.